Iin the upper panel, the cell does not react to the forces, and YAP remains in equilibrium between the cytoplasm and the nucleus. In the lower panel, the cell reacts to the physical forces and this promotes the entry of YAP to the nucleus through the cellular pores. A study that has been published today in the journal Cell, carried out by a team of researchers led by Pere Roca-Cusachs, from the Department of Biomedicine and researcher in IBEC, shows how cell mechanical forces allow to unchain the expression of those genes that promote cancer through the activation of the protein YAP in the nucleus of a cell. Cells apply mechanical forces to the surrounding tissue, producing an essential effect for the function of the healthy tissue. In diseases such as cancer or liver and lung fibrosis, the tissue gets more rigid and mechanical forces increase, promoting the progress of the disease. Apart from governing the growth of organs during embryonic development, YAP is a known oncogene that activates transcription of genes that promote cancer in increasing the proliferation and death of cancer cells. 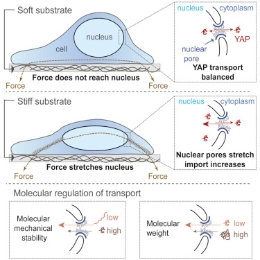 Researchers saw that when forces did not get to the nucleus of the cell, YAP remained balanced between the cytoplasm and the nucleus. However, when forces affected the nucleus, like in rigid areas in the cancer tissue, cells responded by opening the pores of the nucleus and allowing YAP to enter. This activates genes involved in the spreading or cell survival, and allows the cancer to grow and spread.